Mount Kilimanjaro Summit – Luke Blundell-Pophfer remembering his friend Scott. In October 2014, Luke Blundell-Pophfer embarked on the adventure of a lifetime. After months of training, Luke joined a small team of Aussies to climb all 5,895 metres (19,341ft) of Mount Kilimanjaro, the tallest freestanding mountain in the world. Prepared for the physical and mental challenge of the climb, Luke had more reason than most to take on the challenge of beating Mount Kilimanjaro. His fiancé, Solitaire, was seven months pregnant with their first child when Luke met the mountain. On top of this, he had some unfinished business that overcoming a feat as insurmountable as Mount Kilimanjaro would give him the opportunity to complete. In his pack, Luke carried the ashes of his dear friend, Scott, who had experienced a brain hemorrhage several years prior, and when he reached the peak of Mount Kilimanjaro, Luke planned to set his friend free. “I decided to go to Africa and climb Kilimanjaro for a few reasons,” Luke said. “I wanted to become a better person, a bigger person and to do bigger things. I wanted to follow in my dad’s footsteps (he has climbed Kilimanjaro three times). I wanted to make my family proud; make my friends proud and wanted to be part of a good cause – we raised money for the Make a Wish Foundation – that means a lot to me and a lot to Peak Potential Adventures. Embarking on this adventure, Luke was not alone. In fact, he was with a team of seven including his father Shane Pophfer who is Managing Director of Peak Potential Adventures with business and adventure partner Darren Wise. Their business offers people the chance to experience extreme mountain climbing adventures, such as Mount Kilimanjaro and Everest Base Camp, while being supported by professional adventurers and the opportunity to raise funds for The Make a Wish Foundation or the team member’s favourite charity cause. “Peak Potential Adventures won’t take on someone who doesn’t have the capacity to complete a climb,” said Luke. “Both dad and Darren are tough, and really good guys. They’ll teach people how to train for a climb and support them through the whole process. “They are professional adventurers, so it’s a real privilege to watch and learn from them both,” Luke said. From the moment he arrived in Africa, Luke’s entire worldview was challenged. Simple things that he took for granted, like travelling in a car or grabbing a bite to eat became small adventures on their own. “Arriving in Africa, it was unlike anything I’d ever seen before,” he said. “The air was different, all the plants and trees, even the roads were so different to what I was used to [in Australia]. “Kids would come up to you and just ask for money. In all honesty, I can’t understand how some of the most poor people survive there. 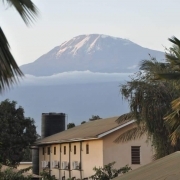 Arriving at their accommodation in Moshi, Luke and the team spent their last night relaxing and preparing for the climb. At the resort Luke was introduced to tour guides, Godlisten (Goddy), Yesse and Mandey who would lead them up the mountain. “I was so impressed with the real friendship I saw between the local guides, dad and Darren. They all really trusted each other, and it made it really easy for me to trust them,” said Luke. After a final “triple-check” of their gear, Luke and the team headed to the base of Mount Kilimanjaro, readied for the amazing adventure that the next seven days had in store for them. “Looking back, I think I was prepared for an adventure. Dad and Darren had told me their stories, and I was ready, but words can never really describe the actual adventure – it’s something you have to feel,” Luke explained. Taking the Machame Route, Luke and the Peak Potential Adventures team, along with their local guides began to climb the mountain. “The Machame Route is one of the most popular, but only has a completion rate of 60 per cent,” Luke said. “When we got to the start of the route, we made sure we were ready and had everything we needed, and then we started. “We started the climb at around 1,500 metres, and even at that height you could already feel the air was thinner than on the ground. “It was then that it really sunk in for me. I was climbing the third tallest mountain in the world,” Luke said. On day one the team made their way to the Machame Camp, which sits at elevation 3,000 metres above sea level. “On the first day, we all went a bit too fast. 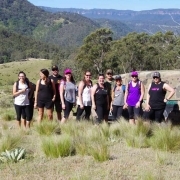 We got to 3,000 metres fairly quickly, because we were so keen, and everyone on the team was super fit,” Luke said. With the fast pace and lack of water, Luke took ill the first night on the mountain. Spinning out, Luke struggled to adjust to the altitude, and was in a bad way when it came time to rest. “I was really lucky that day as dad saw the state I was in, and he was prepared,” Luke said. The next morning, Luke felt “a million bucks” and with a renewed awareness of how important it was to take your time climbing to an increased altitude and to keep hydrated, Luke and the team set off on day two of the climb. “On day two, we climbed from around 3,000 metres to 3,900 metres, and it was a steep climb, and required us to take big steps, almost like lunges the whole way up,” Luke said. “It was a tough part of the climb, and a lot of the team really struggled with it. For me, this was my favourite part of the climb as I was feeling better, and we took it a lot slower. “The training I had done back home was suited to this part of the climb, so I did okay on the second day,” said Luke. Describing the second day, Luke said, “There were a couple of parts on that day where we really saw the dangers of the mountain. If you fell, you could have definitely died. While Luke suffered with illness on the first night, it was after day two of the climb that sickness really took the team, with a combination of a stomach bug and altitude sickness causing some members of the group to experience chest pains and diarrhoea. As the night drew on, exhaustion overtook even those feeling most ill, and they slept. 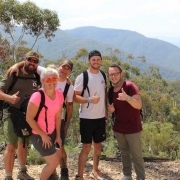 “Even though people did get ill, I remember it being so easy getting to sleep that second night as we were all just completely worn out and exhausted from the climb,” Luke said. On the third morning, Luke began to notice how strange the environment had become, with a lot of nothingness, dirt and jagged, frightening rocks. “It’s like being on Mars or the moon up there,” said Luke. Day three demanded a different sort of discipline from the team, as it required them to make their way to 4,300 metres, and then return to 3,900 metres to allow their bodies to adjust to the heightened altitude. “We went up to 4,600 metres before coming back down to 3,900 metres and camping at the Barranco Wall,” said Luke. While making their way to 4,600 metres, the Peak Potential Adventures team found themselves caught in heavy rain, which only added to the difficulty of the climb. “I’d just taken my skins and my shorts, and had one of those really cheap two-dollar rain-poncho’s with me, which I had to use just to make it through the day. “It was a high incline climb to 4,600 metres, and when we did arrive, we couldn’t stay up there too long because of the rain. We might have stayed up there for around half an hour,” said Luke. Returning to their camp at 3,900 metres, Luke along with the rest of the team turned in for the night feeling fairly miserable. Waking up the next morning, Luke recalls looking down on the “fluffy” clouds. “In the morning, all the clouds were settled. I woke up just above all these beautiful clouds, and I remember exclaiming, “Wow, I’m above the clouds.” Its awesome,” said Luke. The morning of day four was warm, with sunlight replacing the rain from the previous day. The team spent an extra hour at camp in the morning, while they left their gear in the sun to dry out and to soak up the view above the clouds. Soon, they were prepared and packed to go with a renewed energy. Day four saw Luke and the Peak Potential Adventures team tackle the most difficult part of the climb so far. It was on day four that they would climb the Barranco Wall. “Barranco Wall is pretty hectic,” Luke explained. “Before we started, we looked up at the wall and we could see a porter from another team climbing alone. He looked tiny against the massive wall, like a little dot. It was breathtaking to see. “Climbing the wall, there are parts that were really challenging. This is a part of the climb, where it’s not just a trek. You have to get your hands in there and cling to the wall. To stay safe you hold yourself tightly against the wall as you climb,” said Luke. Reaching the top of Barranco Wall, which sits at around 4,400 metres, the team continued their climb, as the mountain opened up into a valley. “You go down through this massive valley, which is gorgeous. There are ancient trees up there too, which are over 100,000 years old and there is one special flower, the Kilimanjaro Impatiens, which you only see on Mount Kilimanjaro,” Luke said. “We camped that night at Karanga Valley which is at an elevation of just over 3,900 metres. It was beautiful up there. The next morning, Luke and the team gathered themselves for the beginning of the final stint of their climb, as the ascent to the peak began. “At this stage, we were so close,” said Luke. “After waking up, we got our stuff together and did a quick climb from our campsite, up to Barafu Hut, which sits at around 4,600 metres elevation. “4,600 metres is really high and if you are going to get altitude sickness on the climb, it’s there,” Luke said. After the four-hour hike, the team arrived at Barafu Hut around 7:30pm and bunkered down for a few hours of rest. “When we got to Barafu, we settled down fairly quickly and got to sleep. We slept until around 11:30pm, and then we had to get up for the final leg of our hike to the summit of Kilimanjaro,” Luke said. Having been braced by the guides and the guys from Peak Potential Adventures, Luke knew that the final leg of the climb was going to take the most effort of the climb. “It is cold up there,” said Luke. “After waking up around 11:30pm, we got on our way around midnight. “Starting at 4,600 metres, you get higher and higher. The altitude and the cold really put you to the test,” Luke said. At this stage Luke was exhausted physically and mentally. He was grubby and felt unclean, and looked forward to a good meal when it was all over, but he knew they were close and the drive to reach the top pushed him forward. “It really became a mental thing at that point. I was exhausted, but I was so close,” Luke said. After hours of pushing, the team marched on in silence. As they neared the top, they were met by heat from the sun, which Luke described as one of the most beautiful things he had ever seen. “When the sun came up that morning, we’d been going for so long and the cold had been tough, it was just an amazing sight and feeling,” he said. When the sun came up, it also gave the team their first glimpse of Stellar Point, which meant they were close to the top. “Seeing Stellar Point helped us all to push on. I remember looking at my mate Mitch, and thinking about all of the goals he was here to achieve, all the people he wanted to make proud, and then looking around at the team. We were all there for some reason or goal, and we were close,” said Luke. Continuing to trudge, the team made their way slowly to Stellar Point. “A lot of people who climb Kilimanjaro only get as far as Stellar Point before turning back,” Luke said. Continuing on past Stellar Point, Luke and the team battled with their minds, just pushing through to reach their goal. “The last hour of the journey is indescribable,” said Luke. It was those little motivations that helped Luke to push through that final hour to the summit at Uhuru Peak. “When we made it to the top, the actual summit at Uhuru Peak, all emotions kicked in. Everyone on the team had made it. Uhuru Peak is located 5,895 metres above sea level. Due to the height, the team was restricted in how long they could remain at the summit. “We got the banner for ‘Make a Wish’ out and took a team photo for the charity,” Luke said. “After we’d done that, I took out Scott’s ashes. We’d made it through our last big adventure together. I said a prayer and looked at a photo I’d brought up of him, and then I took him to a special point on the top and I let him go. “The emotion I felt setting his ashes free was something deep. I can’t really explain it even now. I saw my dad, who is a really tough man tear up when I let Scotty go. I think he was proud of it, proud that I am his son, and proud that he was able to show me the peak of Kilimanjaro,” said Luke. Making a tribute for Scott, Luke admired all of the tributes that had been left at the peak, making sure to watch his step, as there was an honour in the air. Following the farewell to his friend, Luke took a picture holding up a sign telling his fiancé, Solitaire and his nearly born child that he loved them. After 40 minutes at the peak, the team started the journey down the mountain and home. After a day-and-a-half, the team made it to the bottom, and their adventure was completed. Peak Potential Adventures founders, Shane and Darren invites anyone interested in climbing Mount Kilimanjaro or taking an adventure to contact them through the Peak Potential Adventures website www.peakpotential.net.au or social media, as they believe that with the right motivation and training, almost anyone can beat the mountain. “I think most people have the capability of doing it, but it just depends on their preparation,” Darren said. “We can train people to do it. We’ll give you advice, training and help you the whole way. “I won’t sugar coat it, climbing Mount Kilimanjaro is one of the most physical and difficult things you will ever do. Every day is a massive challenge, and for most people every day is outside of your comfort zone, but that’s all part of the adventure,” Darren said.